We awoke this morning in the mist and feeling the 9°c chill in the air. I didn't waste time getting breakfast and getting us down out of the clouds. 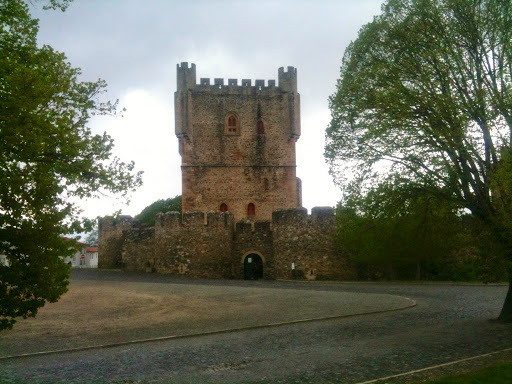 A couple of hours drive, split by a fuel stop has us in Bragança in the north east of Portugal, not far from the border with Spain. A note on buying diesel in Portugal. Look for 'Intermarché' supermarkets that sell fuel as well - it can be quite a bit cheaper. At the time of writing €1.13 p/l as compared to €1.27 elsewhere. I use the offline Maps.me app - type in 'Intermarché' or whatever you want to find and blue dots on the map will indicate where they are. Then I just put the GPS coordinates into my sat nav, easy! I've discovered that here in Bragança, right by the castle that overlooks the town, there is a fantastic free 'auto-caravan' area with water and waste disposal facilities. Nearly everyone here is French, but for a few Dutch. 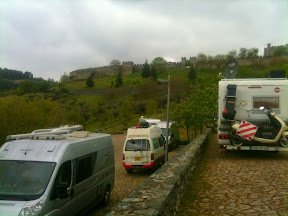 I'm the only small camper among big white motorhomes. Just back from Rio's walk along the valley where we discovered this farm.. Even the small but deadly Rio ran, when he heard the deep lion like voice of the farm dog. I am a bit tired this morning as he was restless last night, probably due to the proximity of big motorhomes that arrived later taking up all the available space around my Hiace - some of which had dogs onboard as well. Next stop - somewhere near Leon in Spain. I won't have Internet most likely as my Portuguese sim will probably stop working when I cross the border. I'll upload when I'm next on wifi.